The Zinfandel Advocates and Producers (ZAP) is a unique organization that combines whimsical interest, awareness, and education about Zinfandel wine. One of their early projects was to collect cuttings from Zinfandel vines from old vineyards across California. The project was completed in 1999 with a total of 90 selections that were grafted on to similar rootstock and grown in the one acre Heritage vineyard in the UC Davis Oakville Research Station in Napa Valley. These vines were extensively tested and their production analyzed. Vines from the most promising clones are being made commercially available. In the vineyard itself, the vines are head-trained, similar to the “old time” procedures of the 19th and early 20th centuries. 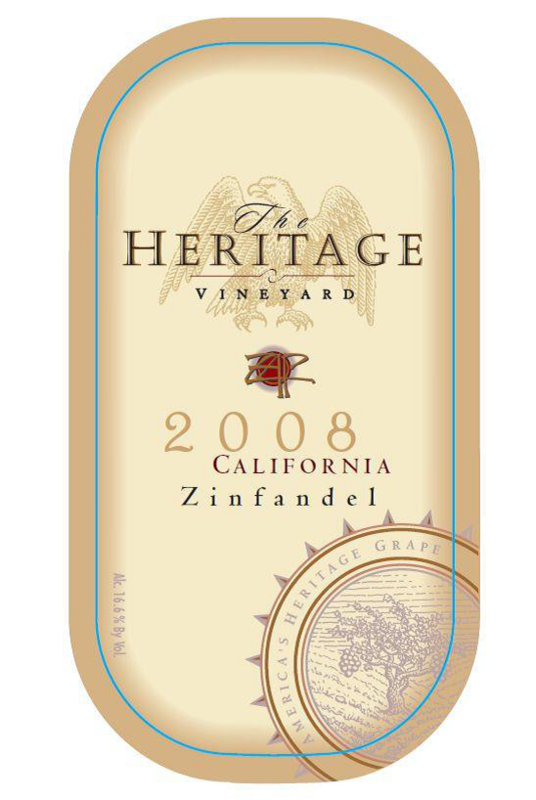 Each year, ZAP selects one of the member winemakers to produce a limited number of bottles from that vintage. Because of the miniscule vineyard size (1 acre), only about 4 barrels of wine are made in any given year. The wines are available only through ZAP and are primarily sold to the membership. “Flights” is the hoity-toity term for a series of wines that are tasted together and usually compared. If one tastes different wines made in the same year these are categorized as “horizontal” or can be “vertical”, tasting the same wine from different years. These tastings are often done with wines from a single winery. Horizontal tasting give a feel for a winery’s scope and highlight their different varietals, winemaking style, etc. and is the type of tasting usually seen at a winery tasting. Vertical tastings show the effects of different weather on the same vineyards with the same winemaker. 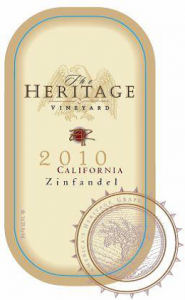 A vertical tasting of the Heritage wines provides a highly unusual opportunity since the grapevines are the same but the vintage, winemaker, and vinification differ. Having bid and won several bottles of Heritage wine at the ZAP festival last year, we had a vertical tasting from 2005 to 2010, excluding the 2009. The information for these is culled from the bottles themselves and the ZAP website. The growing season was moderate with a huge yield. Despite heavy fruit removal, the final crop was very large with 3.1 tons fermented. The wine had extended maceration and was aged in French oak- half new and half old. The final wine is labeled as 14.8% alcohol with 0.11 g/100mL residual sugar and a pH of 3.53. Winemaker’s Tasting Notes: The wine is dense with ripe black cherry, blackberry, and plum tinged with scents of white pepper, violets, chocolate and toasty oak. Its length, richness and balance give the wine flexibility with food, and it should fare exceptionally well as an accompaniment to roasted meats. 2006: winemaker Dr. J. Bernard Seps of Storybook Mountain Vineyards. Again the vineyard was heavily culled with 1.6 tons of fruit fermented. The wine was aged in three year old Hungarian oak barrels racked to French oak, ½ new and ½ one-year old. The finished wine had an alcohol level of 14.9% with a residual sugar of 0.10 g/mL and a pH of 3.70. Little information was available for this wine that was extremely limited and exclusively sold at the ZAP festival. The finished wine had an alcohol level of 14.9%. The crop size was small due to frost and 1.77 tons of grapes were fermented. 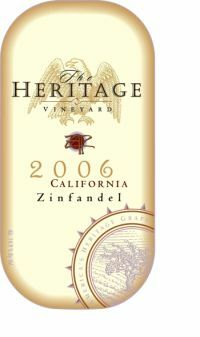 The wine was aged for 14 months in ½ French and ½ American oak. The finished wine had an alcohol level of 16.6% with a residual sugar of 0.18 g/mL and a pH of 3.78. ZAP’s Tasting Notes: Very forward aromas of Zinfandel; spice and vanilla. The flavors are blackberry, chocolate, oak. The alcohol is muted in the spice. The 2010 growing season was a challenging one, with a long, wet spring and an unusually cool and foggy summer that was hit with a three day heat spike in the end of August that literally scorched the grapes, causing a substantial loss of crop. The grapes that survived made up for it by ripening fully due to a near perfect September. 1.84 tons of grapes were fermented. The wine was aged for 15 months in 4 French oak barrels. The finished wine had an alcohol level of 16.6% with a residual sugar of 0.21 g/mL and a pH of 3.52. Winemaker’s Tasting Notes: A bold, fruit forward wine with aromas of blackberry, spice and vanilla finishing with lingering firm yet ripe tannins. All wines were opened about 30 minutes prior to the tasting on February 22, 2014. Each was poured unblinded. We tasted each wine first alone using the typical assessment of color, clarity, bouquet, taste, finish, and overall impression. Each was then tasted with several types of food to suggest their ability to pair with meals. Pairings were judged on a four point “Straube scale”- -1 indicating the pairing made at least one of the pair taste worse, 0 indicating that the pair was relatively neutral with the flavors neither substantially improving or worsening, or 1 indicating that the pairing improved either the food or the wine and 2 indicating that the pairing was great with the combination tasting better than either the wine or food did alone. The group’s impressions (6 people) were roughly averaged and the results presented below. We chose 3 different types of cheese that frequently appear on our cheese plates- a Gouda, Emmenthaler, and a Gorgonzola blue cheese. To “pressure test” the wine with a spicy food, Luke prepared his lamb Rogan Josh (a perpetual favorite despite the use of lamb). Finally, Cathy prepared a sweet/ creamy dessert (cream puffs in chocolate sauce). Despite starting with grapes from the same small vineyard, these wines were remarkably different. The 2005 was clearly over-the-hill and, given the huge volume of grapes that year, we guessed that, even in its youth, it was never a huge wine. The favorite wine of the tasting was the 2006 but the rankings for the other 3 wines were inconsistent. Given the very different taste profiles of the wines, this was due primarily to the differences in tasters’ preferences with regards to the fruit/spice mix. The pairing portion revealed some interesting trends. Green, seedless grapes are a consistent part of cheese plates often served with wine. The pairing of every wine with the slightly sweet, very acidic grapes was a disaster. Also surprising was the lack of any synergy between any of the Zinfandels and the creamy Gorgonzola. Less surprising was the lack of fit between the sweet cream puffs with chocolate sauce and the wines. All but the dying 2005 stood-up well to the spice of the lamb rogan josh despite the relatively high alcohol levels that can heighten the burn. Overall, the tasting was successful. Given the difference in both vintage and winemakers, it is hard to determine how much each of these factors contributed to the differences in the final product. Similarly, with a large number of clones in a miniscule vineyard, the effects of the weather indubitably effect each clone somewhat differently providing an even greater amount of year-to-year variability than might be expected in a more “standard” plot. End result – there were substantial differences between these wines but, probably due to the expertise of the chosen winemakers, each was very drinkable and enjoyable.